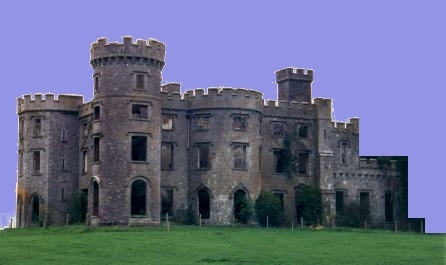 Notes: Killua Castle, and the nearby Raleigh Obelisk, are situated near Clonmellon, County Westmeath, Ireland. The present house was built in about 1780 by Sir Benjamin Chapman and consisted of a hall, dining room, oval drawing room, breakfast parlour and front and back stairs. There was also a stable yard, barn and haggard. From here, the Chapmans administered the surrounding farm lands of some 9,000 acres (36 km2) in the 18th century. In a ruinous condition, it is currently being renovated.